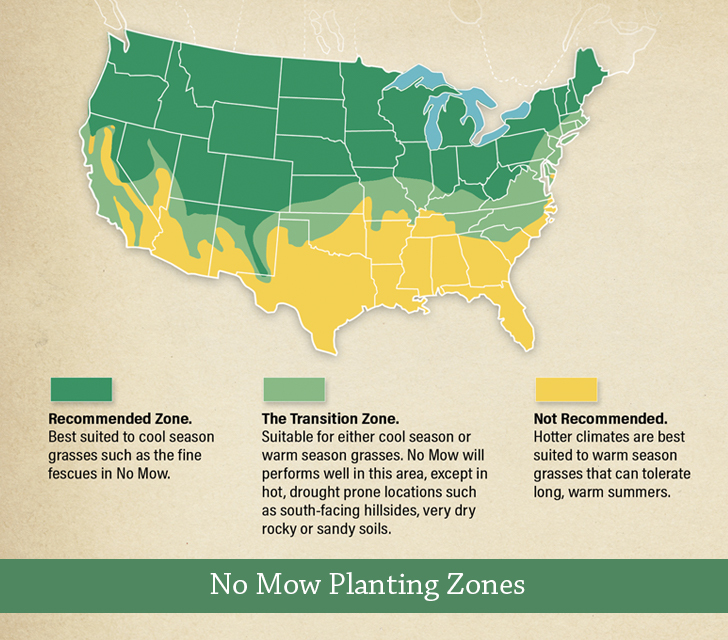 The cool-season grasses that comprise our No Mow Lawn Seed mix are recommended for planting in the United States and Canada in areas at approximately 37 degrees North Latitude and higher. No Mow is also adapted to the coastal areas of the Pacific Northwest, the cooler mountain climates in the east-central states, and in the western mountains from the mid-elevation aspen woodlands to just below timberline. No Mow does best in climates that receive annual precipitation of 25 inches or more, with at least half arriving during the growing season. In drier climates with less than 25 inches of rain, supplemental irrigation can be supplied during dry periods in summer. No Mow is more drought tolerant than Kentucky Bluegrass, making it an excellent alternative for cool, arid climates. While it is an extremely drought tolerant grass blend, No Mow will not survive extended droughts.